Such was the case last week. As I prepared my grocery list I noted several things — in addition to the squash — that needed to be used up: eggs, a variety of cheeses, and some nearly-sour cream. All of which practically begged me to whisk them together and pour them over caramelized onions, creating a wonderfully savory winter tart. The trickiest thing about tarts, whether savory or sweet, is the shell. Although lots of folks use the same recipe for both tart shells and pie crusts, ideally a tart shell is crisp and crumbly while a pie crust is tender and flaky. To add to the confusion, tart shells for sweet tarts (like those you might eat for dessert) are generally sweeter than those for savory tarts (like the squashy one I’ve been rambling on about). I’ve experimented with two tart shell recipes, one of which I ultimately tossed in the trash despite glowing praise from multiple sources and the other of which has never failed me. Guess which recipe I used for this tart. Right, the reliable one. And Chris, who likes neither onions nor eggs, declared himself “not a fan of tarts” but conceded that the crust was “pretty good.” I am a fan of tarts, and I thought the tart itself was pretty damn good. First of all, it contains both goat cheese and caramelized onions, two foods I love. Then, of course, there’s the squash, which lends a light fluffiness to the custard without screaming “squash! (again! 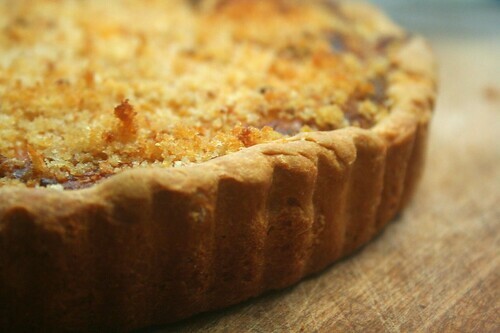 ).” Plus the whole thing is covered in buttered bread crumbs, an addition that initially struck me as odd but whose crunch perfectly complements the tart’s soft egginess. All in all, it’s not a bad way to enjoy squash for the tenth or twelfth time in a month. 1) Combine flour, sugar, and salt in the bowl of a food processor and pulse to blend. Cut the butter into small pieces and add it to the flour mixture. Pulse in the butter until it’s the size of lentils. 2) Add in the eggs and combine until the mixture forms a ball. Press into tart pan. 3) Line the shell with foil, weight with pie weights (or rice), and bake at 400 degrees for 20 minutes. Remove foil and weights and bake 10 minutes more. Remove from oven and set aside. 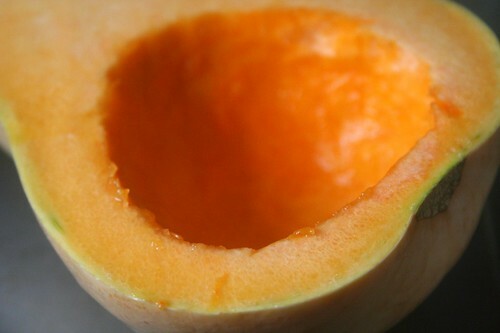 1) Halve the squash lengthwise and scoop out the seeds. Brush each cut side with 1 t. olive oil and place cut side down on a baking sheet. Roast in 375 degree oven for 40 minutes, or until squash begins to collapse on itself. 2) Meanwhile, melt the butter over medium-low heat in a medium skillet. Add onions and sautée until golden brown, about 20-30 minutes. 3) Cool squash and scoop out flesh, then purée in food processor. Add eggs and cream, then process until combined. Transfer to large bowl and stir in cheese, herbs, salt & pepper, and onions. Pour mixture into shell and smooth with silicone spatula. 4) Pour melted butter over bread crumbs and stir until combined. Sprinkle bread crumbs over filling and bake about 40 minutes, or until set. Cool 10 minutes before serving. This entry was posted on December 22, 2008 by Megan @ When Harry Met Salad. 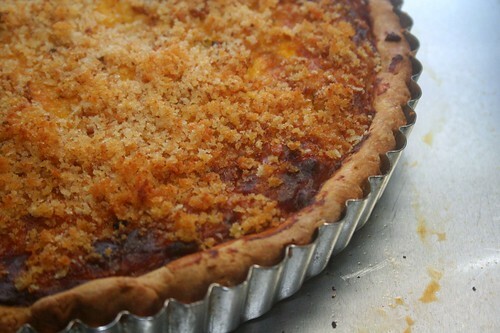 It was filed under eggs, dairy, & cheese and was tagged with butternut squash, caramelized onions, squash, tart, vegetarian. If that culinary Philistine you live with won’t eat your tarts, I will. Send them to me and I’ll pass them off as my own. yum yum! I’m always looking for something to do with squash. I’ve finally eaten all the butternut squash, but I still have a couple sweet potato squash, which would probably work fine in this recipe. I’ve decided that I love squash because they’re so easy to winterize: 1. pick. 2. put in basement. They last forever (well, 2 months and counting). I’ve just received my seed catalog and I’m picking out squash to plant next spring. What the hell DOES Chris eat?? That boy needs to just get over it and try some damn new foods, already! Megan, I want to thank you for calling my attention to the release of Bittman’s vegetarian book. I already had “How to Cook Everything,” but I asked for and got “How to Cook Everything Vegetarian” for Xmas, and I love it! 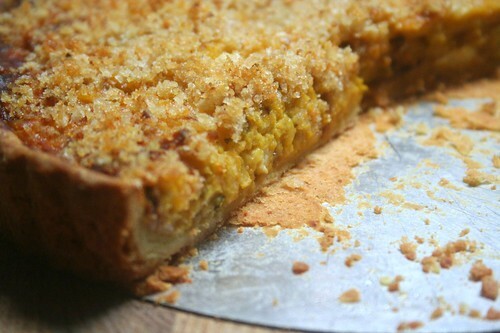 I love to make tarts, and this sounds like a good way to sneak squash into my two guys. I can’t wait to try it. I discovered your blog when looking for a recipe for lavender lemon cookies. I made them and then I made this tart too. And now I have spent a lot of time reading your entertaining blog. My husband is actually the one that thinks more about food in our family. As for me, I like to make super crafty things like these two recipes and also designed the brand for http://www.suziesfarm.com, a local CSA to which we now belong and sing the praises of to everyone (we spend a lot of time thinking about food and quoting Polland and Kingsolver). It’s warmer here in Southern California. However, as we have thinner skins, when the temperature drops below, say, 60 degrees, we love the excuse to make something warm and buttery (of which you have plenty on your website). Thanks for your work. Looking forward to more posts! this sounds awesome…going to make the kale pizza now, though! Just made it – amazing!